We had the opportunity to facilitate a review for some items from the Holiday Collection Line at Zubels. As the holiday season is rapidly approaching we are all looking for fun gifts to put under our tree for Christmas morning. If you are looking for eco-friendly, adorable and 100% safe toys for your little one look no further. Zubels has your back. All of their items are 100% hand knit, 100% cotton and 100% non toxic. We received some toys from their Holiday Collection. A 12 inch blue and white soldier boy, a 4 inch Santa, a 4 inch Teddy Bear, and a Reindeer Rattle Stick. Both the reindeer rattle stick and the little teddy bear rattles. These two are Brandi Lynn favorites. At almost ten months, she loves anything that makes noise. I have no worries about her putting these items in her mouth because Zubels uses a low dye and everything they use is non toxic. I also don't worry about any parts coming off. The products are very well made, right down to the tiny details that make them adorable. You can see that Zubels puts a lot of care into making their products safe for your little ones. 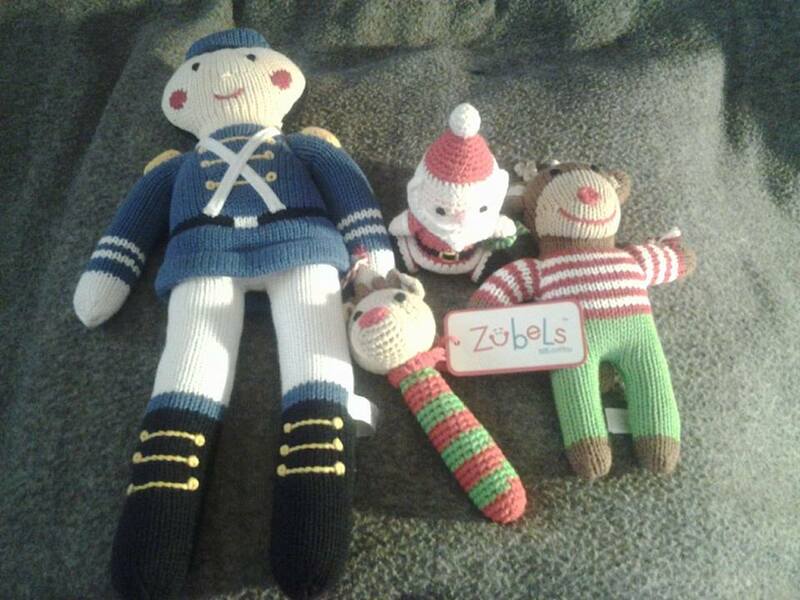 Zubels also has some of the best prices I have seen for high quality hand made items. These would be perfect for stoking suffers, or to top a gift off. They also have a variety of other products that are adorable hats, sweaters, dolls, rattles and more. Zubels put smiles and giggles on the faces of children everywhere. If your looking for a safe reliable place to get your children eco-friendly toys that are 100% safe, definitely take a look at what Zubels has to offer. Their items are hand knitted with love, you can see it in each rich small amazing detail. They provide a great option when it comes to the joy and the safety of our beloved little ones. Check out another Zubels review in our Holiday Gift Guide . You can connect with Zubel's via Facebook , Pinterest , Instagram and Website . Wow! I can't believe these are all handmade! These would be great to tie to larger, wrapped gifts. I can't believe these are all handmade! They would make great gift toppers! These are very adorable!! Nice review!! These sound like neat products. I love it when something is handmade and the quality is high. These are very cute and I love that they are eco friendly. I love these! The cheerleader & the football player would be neat for my niece & nephews, but the Christmas ones are neat, too!